The beginning of every year presents the opportunity to start fresh and new. As an industry, it’s also the perfect time to step back, assess and, if needed, refocus efforts. As we enter 2016, protecting the environment continues to be a high-priority across the U.S. as well as in many other countries. While there's disagreement on the details, one thing continues to prove true: sustainability is increasingly important for consumers and companies. Sustainability sounds simple on the surface, but in practice there is quite a bit involved. As we explore more ways that we can minimize our impact on the environment, recycling continues to be a part of the conversation. Much more goes into the practice of sustainability beyond recycling, but recycling remains one of the simple ways consumers can "be green." While many may think recycling is "taken care of," we know there is still much room for improvement, especially in the United States. Americans are not consistently recycling all of the valuable packaging materials they consume, such as aluminum, paper, plastic, as well as newer materials to enter the everyday recycling bin, such as food and beverage cartons. Cartons are one of the most sustainable packages available. They are lightweight and compact, are made mainly from paperboard, a renewable resource, and have a low carbon footprint throughout their lifecycle. All of this makes it a very attractive packaging option for food and beverage producers to use. Additionally, the paperboard used to make cartons represents some of the highest quality fiber available in the residential recycling stream. This makes it an attractive recyclable material that is in high demand by paper mills. As vice president of recycling projects for the Carton Council of North America and Vice President Environment for Tetra Pak Americas, it's my job to know the facts about carton sustainability and recyclability. Six years ago, four carton manufacturers, Elopak, Evergreen Packaging, SIG Combibloc, andTetra Pak, as well as associate member Weyerhaeuser, joined together with the mission of delivering long-term collaborative solutions to divert valuable cartons from the landfill. We recognized that we were stronger together and could make a bigger impact to increase carton recycling infrastructure and recycling of post-consumer cartons. To help better understand the sustainability of cartons, let's define what they are. Easily recognizable, cartons are a common type of packaging for food and beverage products available everywhere from local convenience stores and coffee shops, to big box chains and even school lunch cafeterias. There are two main types of cartons— aseptic (shelf-stable) and gable-top (refrigerated). 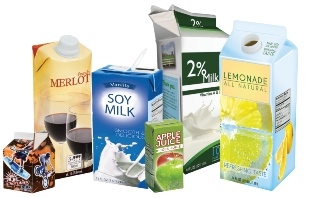 Aseptic cartons are commonly used for soup and broth, soy milk, and even wine– products that don't need to be refrigerated until after they're opened. Gable-top cartons are found in the refrigerated sections of grocery stores and are used for products such as milk, juice, cream, and egg substitutes. Both types of cartons are made primarily from paper in the form of paperboard, a renewable resource from responsibly managed forests. . Paperboard has proven itself to be the reusable, recyclable substrate for today’s environmentally conscious consumer. Additionally, cartons have thin layers of polyethylene (plastic) and aseptic cartons also contain a very thin layer of aluminum to make them shelf-stable. On average, aseptic cartons are comprised of 74 percent paper, 22 percent polyethylene and 4 percent aluminum. Gable-top cartons have an 80/20 ratio of paper to polyethylene. Once consumed and put out for recycling collection by consumers, cartons are taken to a materials recovery facility (MRF) to be sorted and baled. The bales of recovered cartons are then shipped to paper mills, where the cartons are mixed with water in a hydrapulper (essentially a gigantic blender) to separate the paper fiber from the plastic and aluminum. The paper fiber is then ready to be used in manufacturing new products such as printing and writing paper and tissues and paper towels. The aluminum and plastic left over can be used in different ways such as energy generation or manufacturing of lumber board-like materials. Alternately, whole cartons can be remanufactured into green building materials without needing any material separation. Consumers are increasingly taking the environment into consideration when making purchasing decisions. A survey conducted by the Carton Council revealed that 86 percent of respondents said that they expect food and beverage brands to actively help increase the recycling of their packages. As the expectation for producer responsibility grows, food and beverage companies are exploring every opportunity to up their sustainability efforts. Due to the growing interest of food and beverage companies, and the natural alignment of our collective interests in sustainable packaging, we launched the "Carton Recycling Champion Network" in 2014, and now have a total of 12 companies actively participating. These companies recognize the importance of ensuring that their consumers understand the recyclability of cartons. Not only have they demonstrated enthusiasm to help raise awareness to their customers, but they also collaborate with us on an ongoing basis about other ways they can make an impact. WhiteWave Foods is an active champion of our consumer education campaigns across the United States. Last year, the company sponsored a campaign in Southern California, one of many, to help get the message of carton recycling to residents. It is with strong industry collaboration like this that we can collectively work toward greater change and improve the environmental impact all of us have on this planet. When the Carton Council first formed six years ago, only 18 percent of U.S. households were able to recycle cartons. We knew that the first step to grow recycling was to work with recyclers to build demand for recovered cartons as a valuable commodity, and also to build the supply with MRFs. Since then, thanks to collaboration with stakeholders and entities along every point of the recycling supply chain, access to carton recycling nationwide has increased by more than 205 percent. Today, 56 percent of U.S. households can recycle food and beverage cartons in their local recycling programs. We are committed to building a sustainable infrastructure for carton recycling nationwide by working with stakeholders at each point of the recycling supply chain– from the recycling programs and facilities to brokers, paper mills and others. Each entity has a role in contributing to the access of carton recycling and achieving recycling of cartons. The Carton Council works both broadly and individually with recycling stakeholders nationwide who are looking to bring carton recycling to their local programs. And, once the needed local infrastructure for carton recycling has been established, we work with the program officials to help conduct outreach to the residents, letting them know cartons are now accepted in their program through communications materials and education campaigns. As a result, more than 62 million households across 11,000 communities can recycle their food and beverage cartons, with more joining the count every day. All of this has been made possible through collaborative partnerships and industry engagement. We also recognize that building access is not enough and we strive to increase carton recycling. As previously mentioned, we work with communities, helping educate residents and motivate them to place cartons in the recycling bin. But we're not stopping there. The Carton Council also works with schools across the country to help establish carton recycling programs to recover their high volume of milk and juice cartons. In 2014, the Carton Council joined The Recycling Partnership, an organization dedicated to improving the collection of all commonly recyclable materials. It is public-private partnerships like these that will help local governments provide more convenient and efficient recycling programs, making it easier for Americans to recycle. As I said, a new year gives us the opportunity to set new goals to achieve. And for 2016, we are excited about the outlook of carton recycling. As much progress as we've made thus far, we are always looking forward to more. Cartons are becoming a mainstream recyclable item and their value as a sustainable, in-demand material should not be overlooked. The growth that we have achieved in carton recycling access just in the past six years proves how much can be accomplished when the industry comes together to work toward a common goal. We look forward to continuing that collaboration to support sustainability and recycling goals nationwide.